Urban Decay Primer Potion – or UDPP as it’s also known in our beauty obsessive circle – is one of the cult-classic, must-have products of the beauty world. So it may be a bit shocking to know that when I bough ‘sin’, the latest edition to the UDPP family, last week – it was the first time for me. Having tried it now for almost a week I can honestly say I don’t know how I ever managed to wear eyeshadow without it. It magically manages keeps all eye shadow frozen in place all day long. I gave UPDD the ultimate test this weekend, as I was at a family wedding. So it had to hold some pretty heavy shadow in place all day long and it totally managed. Even withstanding some pretty intense Scottish dancing and the odd teary moment. This has managed to become an absolute must have for me and I will NEVER wear shadow without it again. Not even a sweep of a pale neutral, in fact at my laziest I will probably just use this on it’s own – as the ‘sin’ shade is a pretty beige-pink with shimmer and makes a lovely base. This is currently in the running for my favorite purchase of 2010. If you don’t have it yet then I think you should definitely put it on your list. Apologies for the lack of individual pictures by the way, camera is playing up. I bought this myself. All reviews are honest and impartial. Yes I love this too, it has taken over from my MAC primer…..LOVE IT!!! Wow if it can withstand a Scottish wedding then it must be good! How long till pay day? 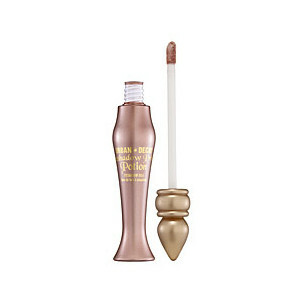 I have it on authority from Get Lippie that the Sin version is easier and smoother to blend that the original version. I have had no trouble blending shadow on top of it – and I am no expert! I’ve recently purcased the UDPP, its in a lilac bottle, and I totally agree. It is the best I’ve used. I’ve tried no. 7 primer to compare, and the UDPP is far superior in quality! I think it beats Laura Mercier – that’s impressive! can you pleaseeeee tell me where can i buy urban decay products in london??? is there a shop in oxford ?